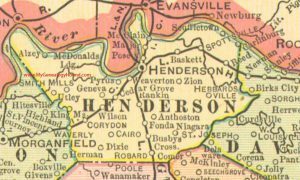 Henderson Tourist Commission – Have You Heard of Henderson, Kentucky’s Lucky Horseshoe? Henderson Tourist Commission / Ellis Park / Have You Heard of Henderson, Kentucky’s Lucky Horseshoe? Have you heard of Henderson’s lucky horseshoe? One might think it would be found at Ellis Park Race Course, where bettors try their luck on thoroughbred beauties. However, Henderson’s lucky horseshoe isn’t actually a horseshoe, but a horseshoe bend in the mighty Ohio River. Horseshoe shaped bend in the Ohio River. Legend states that hanging a horseshoe on or over the door of a home will bring good luck to those inside. Being situated on the Ohio River’s horseshoe bend, Henderson therefore holds the good luck! The mighty Ohio’s horseshoe bend makes some peculiar things happen in Henderson. Is it luck or coincidence? 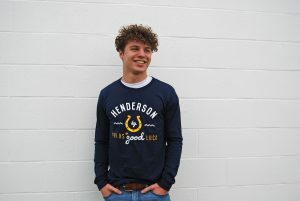 “Henderson Holds the Good Luck” long-sleeve t-shirt. Take for instance the flood of 1937. Over 20 inches of rain fell in Henderson over an 18-day period. How is it that Henderson avoided major flood damage, luck maybe? The city of Henderson sits on a high bluff and was therefore spared of drastic flood damage. Every other town in Kentucky located on the banks of the Ohio River flooded drastically, experiencing severe devastation. 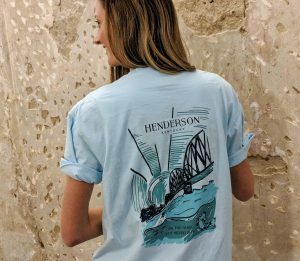 Leigh Harris, publisher of the local Henderson newspaper, wrote, “Henderson is on the Ohio, but never in it!” This popular saying is still heard today, and is displayed on this shirt. 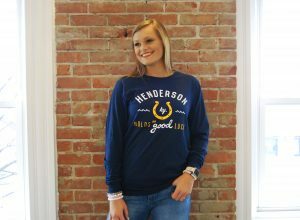 This short-sleeved pocket shirt can be purchased in Henderson’s Welcome Center gift shop. “On the Ohio, but never in it,” light blue t-shirt design. If you go back further in history, the city of Henderson luckily dodged another near tragic event on the Ohio River. 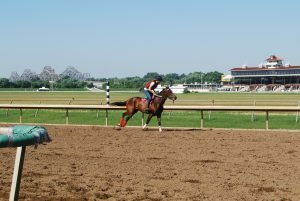 Henderson’s horse racing track, Ellis Park, is often mistaken as being located in Indiana. But there is more to this story! Ellis Park with the Ohio River bridge in the background. When Kentucky was founded, the northern border of Henderson Kentucky stopped at the Ohio River dividing Kentucky from Indiana’s southern border. However, in 1811, an earthquake changed the course of the river and left dry land to the north of it. Since the border remained as it was in 1792, Ellis Park is technically in Kentucky, though it lies on the opposite side of the Ohio River. The city of Henderson avoided a crisis and now thoroughbred horses run on the horseshoe bend on the Ohio River. Try your luck and bet on live thoroughbred races all summer long at Ellis Park! 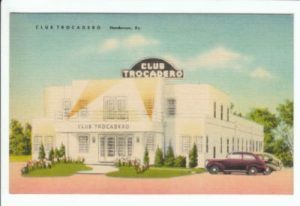 Vintage postcard of Henderson’s Club Trocadero. Speaking of trying your luck, Henderson’s horseshoe bend used to be home to one of Kentucky’s extravagant and elite underground gambling facilities called Club Trocadero. Though it operated on the books as nightclub, its reputation was known for the 400 illegal slot machines on the second floor. Only couples were allowed through the front door and there was a strictly enforced dress code. The club was partially owned by the town sheriff for a few years. Can you imagine the appeal of a luxurious and illegally operating gambling club that was partially owned by a sheriff? It didn’t matter if you were a townie couple or big name gangster, everyone wanted to try their luck at the Troc! This story has us feeling like spreading the luck! 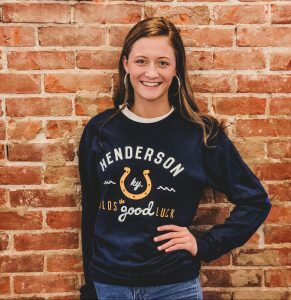 Save big with our Saint Patrick’s Sale, where all of our green Henderson gear is 17% off, and pint glasses and shot glasses are buy one get one half-off! Just in time to celebrate Saint Patrick’s Day! Shop the new “Henderson Holds the Good Luck,” look or our new Comfort Colors “On the Ohio, But Never In It,” t-shirt by visiting our online store or Welcome Center Gift Shop at 101 N. Water St. Our Saint Patrick’s Sale is in-store only from March 4-15, 2019. Check out more stories like this one by visiting our blog!